The Archdiocese of Omaha is bringing together some of its most athletic priests to display their skills on the diamond for all to see. 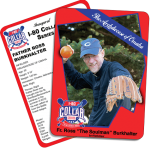 The Inaugural I-80 Collar Series will be played Sunday, June 21 at Werner Park in Papillion. The first pitch is set to be thrown out at 5 p.m.
All proceeds from ticket sales will assist in promoting vocations to the priesthood, consecrated and religious life in the Archdiocese of Omaha and the Diocese of Lincoln. More information about the event, including ticket prices, are available at spiritcatholicradio.com or by listening to Spirit 102.7 FM (402) 571-0200. You’ll find the complete story in this week’s issue of The Elgin Review.